In 2018, investors were paying more attention to cannabis stocks than ever before. 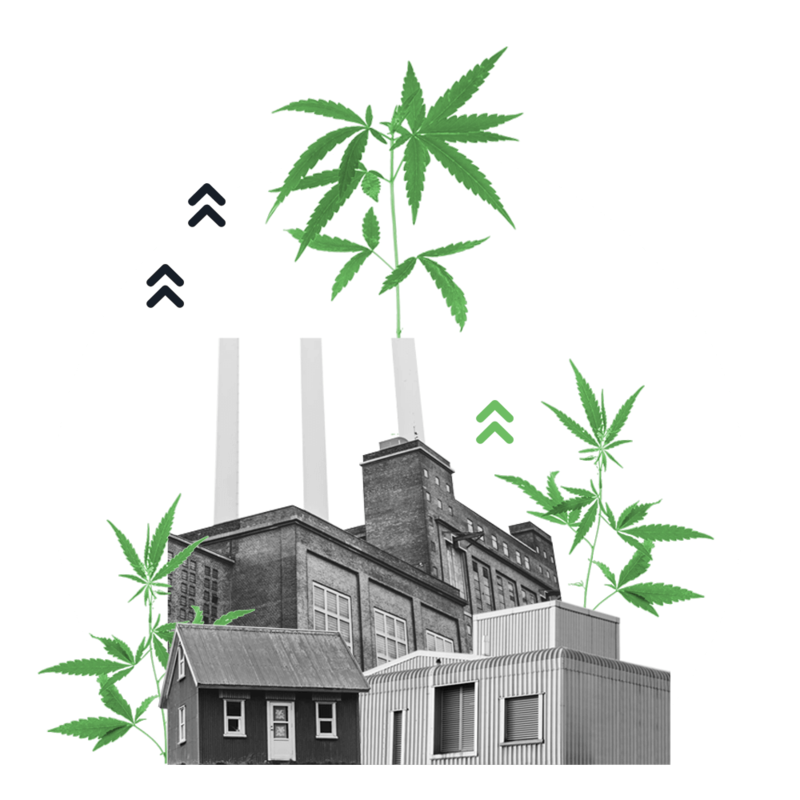 With the sector’s progress more keenly watched than the passing of a joint, it’s high time Finimizers got to pick up a guide to the green-shoots investment world springing up around weed. Waves of cannabis legalization have rolled over the world in recent years – initially for medicinal purposes, but increasingly for recreational use. In the US, legalization at state level began with California’s medical-use approval in 1996, although the drug remains outlawed federally, with weedcos unable to open bank accounts. Across the northern border, meanwhile, Canada has led the way in bringing cannabis companies into the financial fold – with the result that it’s now home to all of the industry’s biggest players. As of November 2018, ten US states and Washington DC have officially legalized recreational use – and the majority are chill with it as long as you’ve got a doctor’s note 😉 The UK has now joined countries like Australia, Germany, and Switzerland in allowing medicinal cannabis use, while Uruguay and Canada have already gone the whole hog and legalized recreational use completely. 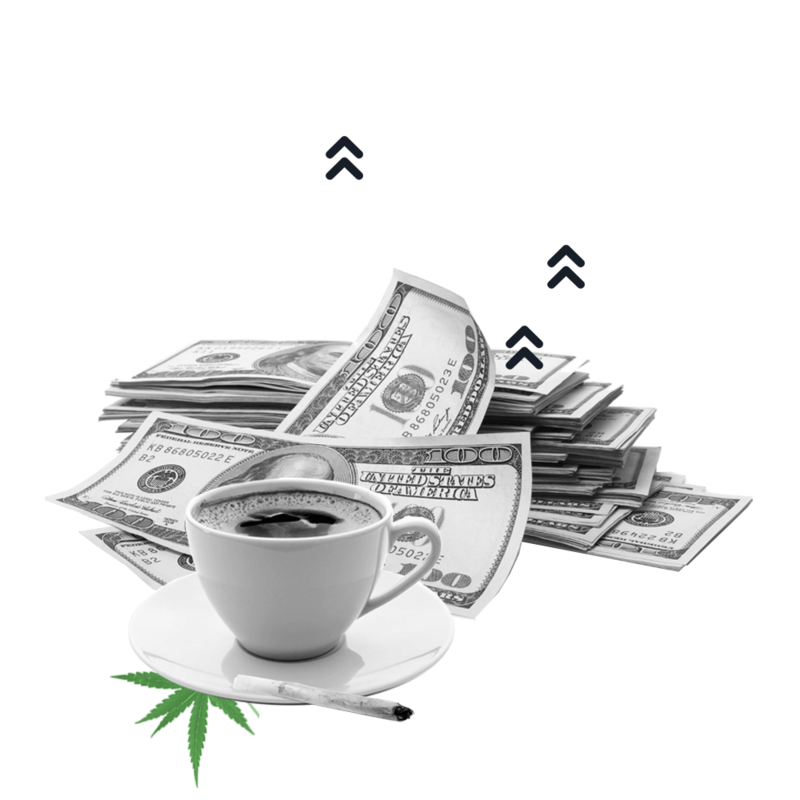 According to cannabis research and investment group ArcView, legal sales of cannabis in 2018 will amount to $13 billion – rising to $32 billion by 2022. Once you add “ancillary services” (things like packaging, logistics, or marketing – services that help the industry to keep puffing but don’t directly touch the green stuff), ArcView estimates the market’s worth $20 billion now and is set to double in just three years. Also known as “growers” or “cultivators”, these companies legally produce (i.e. with a license) cannabis plants, growing and harvesting the green. Producers vary between large-scale and craft (just as in the beer industry), and may have other distinctions depending on the intended use of their crop – e.g. medicinal vs. recreational. Once the bud’s harvested, it has to be turned into a product ready for sale. Processors create concentrated oils, edibles and the like from raw cannabis, using often expensive machinery and chemicals. A world away from shady sales on street corners, legal cannabis distribution is much like that of anything else. 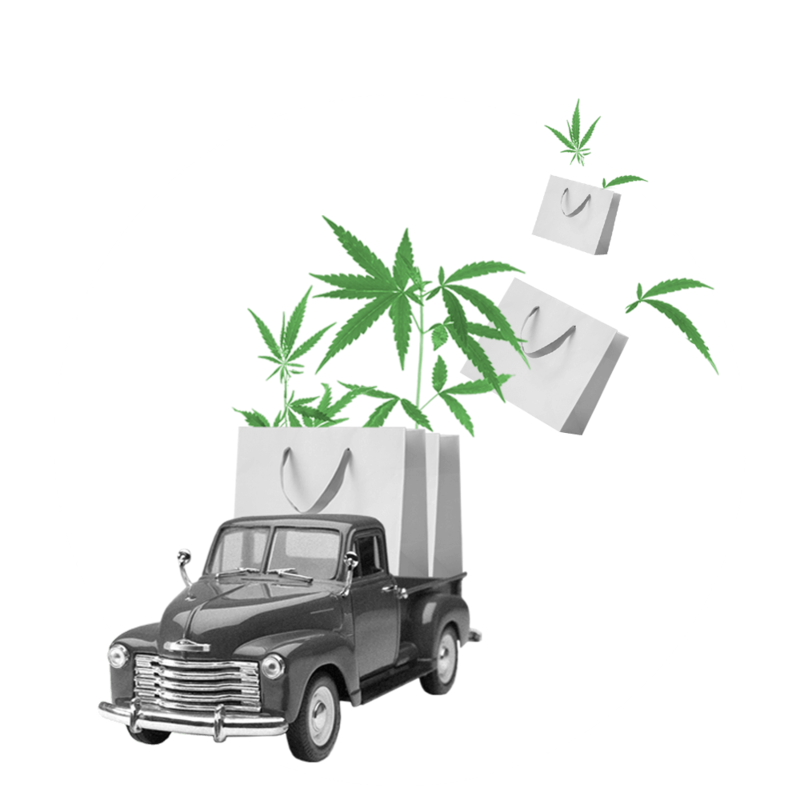 Wholesalers buy their products of choice, aiming to sell them on to specialist retailers or dispensaries for medical purposes. Some might focus on a particular product or brand, backing their bets with marketing dollars to grab customers’ attention. Others might focus on getting as many retailers as possible on board as partners, promising to get them a wide range of weed products. Sell, sell, sell! As with any product, it gets into the customers' hands via stores – both physical and, increasingly, online. The sales process is slightly different if cannabis is being sold for fun or for health reasons. But the ways in which companies aim to reach customers are pretty constant: e.g. building brand loyalty, becoming specialists in one area, or offering impeccable service through well-trained staff. There’s more wrapping cannabis companies together than separating them. Their sales are all growing faster than a Camberwell Carrot, but the companies are spending hundreds of millions of dollars to make it so, meaning profits are thus far non-existent. That hasn’t stopped companies shopping for each other and getting bigger via acquisitions. 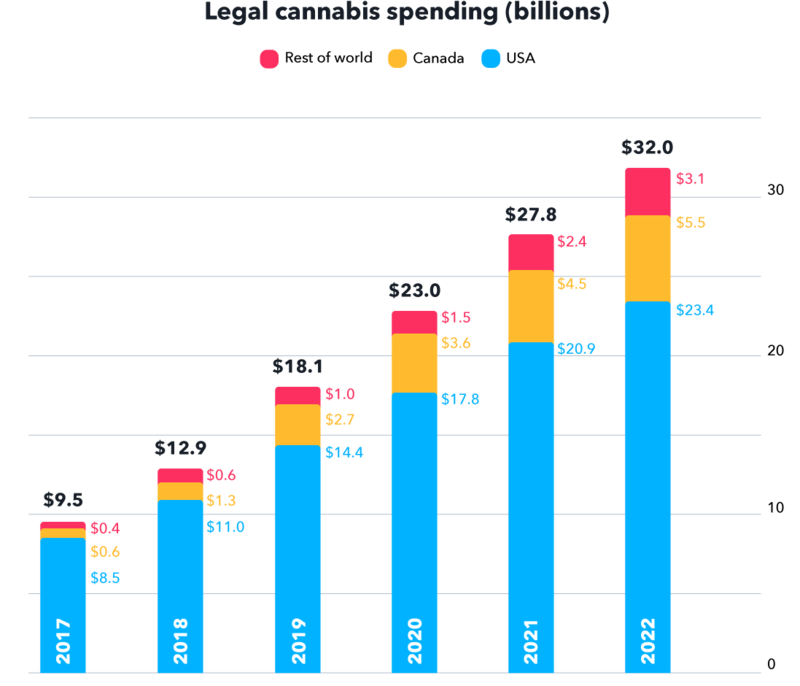 Sales of legal cannabis are set to grow by 36% in 2019 compared to 2018, and the prospect of even more legalization around the world should boost growth further going forward. In the first six months of 2018, cannabis companies listed on stock exchanges grew their sales by 150% on average. Growing ain’t cheap. Cannabis companies are spending big on ramping up production facilities, marketing and negotiating the complex laws that come with success. In the first half of 2018, listed cannabis companies generally turned in a loss, with average losses one and a half times greater than revenues. In the first half of 2018, there were 145 mergers and acquisitions among cannabis companies – double the number a year prior. As companies gear up for the big leagues, combining forces can help them get bigger quicker – eliminating duplicate costs while adding new customers. Investing in a single company’s shares is a pretty risky thing to do – the fate of your investment’s tied to a single business which could do really well or, equally, disappoint. Investing in a group of similar companies is less risky since it allows you to benefit from the trends shaping the entire sector – and if something goes wrong at one of the companies, hopefully good goings on at the others protect you from losing too much. Safer still is further diversification by way of investing in the overall market. If cannabis stocks do well, then you’ll have a smaller benefit, but you’re also more protected if the entire sector goes to… pot. Big-time booze merchant Constellation Brands (owner of Corona beer) increased its stake in Constellation from 10% to 38% in August 2018, paying $4 billion for the privilege of gaining a larger slice of what it called the “recognized global leader”. That’s just as well: Canopy, like many high-growth stocks, has been burning through cash. In the first six months of 2018, revenues grew to $37 million but losses widened to $110 million as the company spent big on additional greenhouses, a box-fresh distribution center and bringing new acquisitions into the fold. 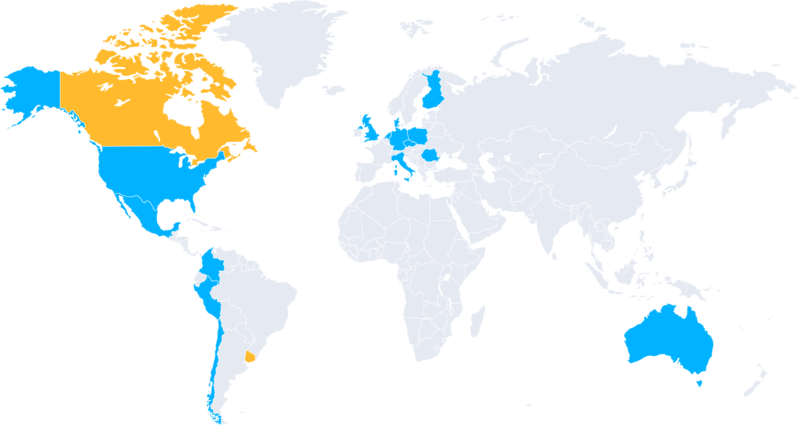 Speaking of M&A… Canopy’s busy targeting expansion into 30 cannabis markets around the world. It opened a Latin American branch following the purchase of local weedos Spectrum Cannabis Colombia in July, and has since strengthened its grip on Chile and Brazil, too. And that’s not all: Canopy’s expanding in Germany, Denmark, Spain, and the Czech Republic, beginning to grow plants locally rather than importing cannabis from Canada. The first marijuana unicorn (i.e. a company valued at $1 billion or more), Canopy was also the first cannabis company to list shares on the Toronto and New York stock exchanges – the former way back in 2016. In addition to having a stake in the Whistler Medical Marijuana Corporation, Cronos also wholly owns the medical marijuana brands Peace Naturals and Original BC. As with its many competitors, the company’s growing its capacity for, uh, growing. Cronos is focusing its efforts on Peace Naturals, offering cannabis oils that make more money than the dried stuff, in the hope that it’ll help Cronos break into the hallowed hall of profitability. In the first half of 2018, Cronos’ sales were just shy of $5 million and its losses were a little over $1 million. Next stop: the world. Cronos hopes to build up its business in Israel and Australia – the latter in partnership with a big financial backer. But Cronos doesn’t see itself as just trying to grow into the space regulation creates: the company’s also aiming to develop valuable intellectual property related to its specialized cannabis growing methods that it can ultimately sell or license to other companies. In February 2018 Cronos Group became the first weed company to list on the Nasdaq stock exchange. Tilray raised $153 million in its July initial public offering (IPO). Its crowning success since then came when the US Drug Enforcement Administration gave the company permission to export its cannabis from Canada to the US for use in medical research. Tilray’s revenue in the first half of 2018 was up 75% on the same time last year to $18 million, but it still lost $15 million overall, partly thanks to the cost of its IPO… hiring bankers isn’t cheap! Growing weed can be thirsty work – and Tilray’s getting busy selling its products to liquor firms, principally Canada’s Nova Scotia Liquors. Alcohol and soda companies alike seem interested in partnering with cannabis companies to create infused drinks, with Coca-Cola and PepsiCo reported to be considering investments in the space. They’re hoping to stay top of consumers’ minds whenever – and however – they’re chilling out. Tilray was the first cannabis company to list on the Nasdaq stock exchange via an IPO. In May, Aurora bought rival MedReleaf in the biggest cannabis deal to date: around $2.5 billion. Aurora’s also getting involved in more of the cannabis value chain than some of its rivals – for instance, it’s hotboxing with Germany’s largest medical cannabis distributor. The company’s also invested in a handful of other weed companies, hoping to go along for the ride if it misses out on a key trend itself. Aurora was among one of the highest-growth weed companies in the first half of 2018: sales were over 200% higher than last year, at $54 million. Its losses over the same period were almost $100 million, though. Guten Tag, Europe! In addition to its distribution agreements across Canada, Aurora’s hoping to take a deep breath of German air. The company plans to take advantage of its access to one of Europe’s largest medicinal cannabis companies’ broad distribution network in order to get its gear into more than 25,000 pharmacies. 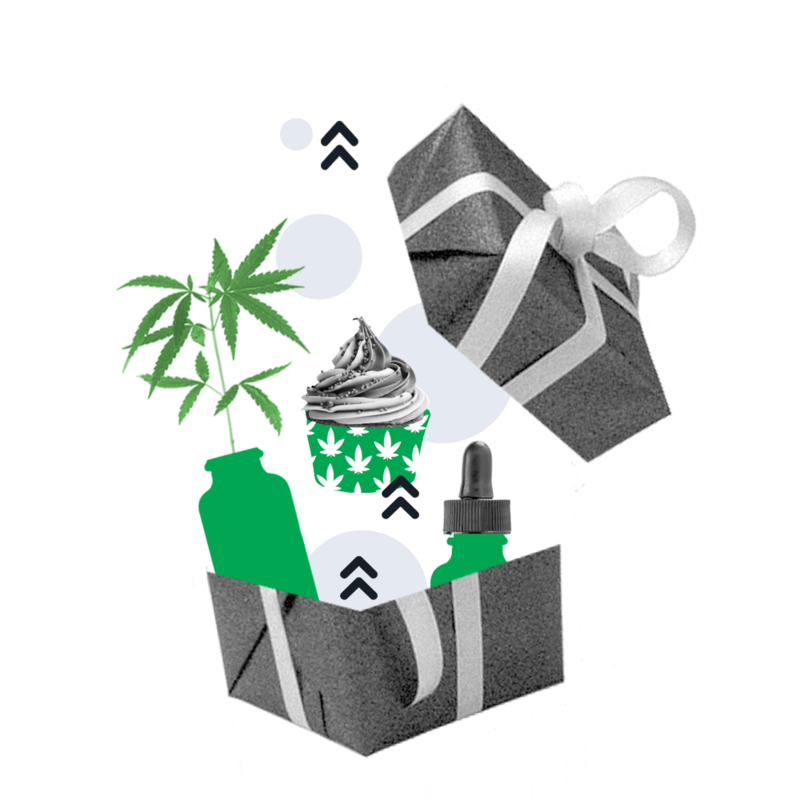 Now you’re loaded up with that dank weed knowledge, visit Finimize Discover to compare investment options for accessing the sector – including robo advisors, cryptocurrency exchanges and brokers who can help you buy cannabis stocks, if you feel like partaking. Got the munchies for more? Check out CMC Markets’ New Highs: The 8 Cannabis Stocks To Watch – for free!